Today's frugal tip takes you to CVS for a couple of quick freebies! Find your closest CVS, grab any coupons you need & start saving! You can find this weeks ad at CVS.com. This week, CVS has 2 definite freebies! These items are free after ECBs (Extra Care Bucks). What that means is that you pay for the first one up front in full (minus any coupons). You get your ECBs at the end of your receipt. You can use these on your next order (which can be immediately). They expire a month after issue. Crest tp (see above) $3.50- ($.75/Crest toothpaste MC(manufacturer's coupon) from the 2/7/10 P&G (Procter & Gamble) insert) = $2.75 oop (out of pocket) and get BACK $3.50 in ECBs!!! That means that even AFTER taxes, CVS & Crest just PAID you to take toothpaste home to your family! There is a limit of 2 for this offer which means you can get a total of 2 items with your Extra Care card. You can either get 2 toothpastes, 2 rinses, or 1 of each. 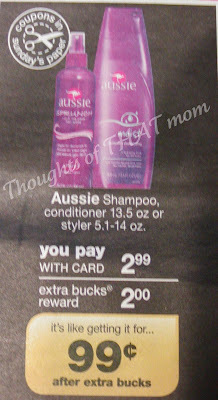 Aussie Shampoo or Conditioner (13.5oz) or Styler (5.1-14oz) $2.99 = $2.99 oop & you get $2 in ECB back. (limit 1) No, this isn't free. However, it's a pretty incredible deal for a high-end shampoo. Can it get better than this, though? Can we get it for free? OF COURSE we can! Aussie (see above) $2.99 - ($1/any Aussie product from the 2/14/10 RP (Red Plum) insert) = $1.99 oop & you get $2 ECB back. They pay you a penny to take this high-end shampoo home! Essentially, this means you get a penny off your taxes. Look at this way, though, you'd have paid taxes anyway regardless of which product you bought! There is a limit of 1 for this offer which means you can only purchase one item total for this deal (not one of each item). You do need to obtain a CVS Extra Care card in order to obtain these deals. It is easy to obtain & you can do so when you go in to do your shopping. The card will also include a keytag card which I keep on my card at all times. *$2.99 sale price - ($1) MC 2/14/10 RP = $1.99 oop (out of pocket). Get $2 ECB back for use on your next order. *$7 sale price - 2($.75) MC 2/7/10 PG - ($2) ECB from above = $4.25 oop. Get 2 $3.50 ECBs back. *I purchased both of these together because you won't have enough oop to use the ECB from one order on another. That's okay, though. There will be enough deals in the next month so you'll have ample opportunity to use your $7 in ECBs. Confused about some of the terms I've used? Find explanations and a breakdown of how I list my deals on my definitions page.